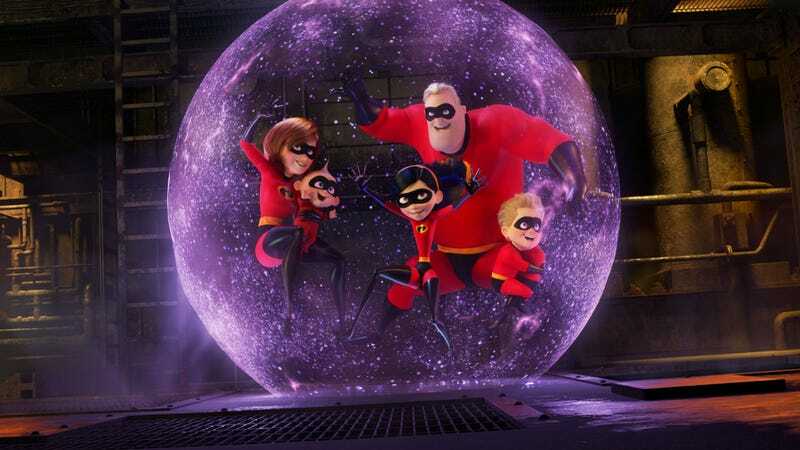 The Incredibles are back, minus the “The,” in Incredibles 2. Even with the release of a brand new trailer, much is still unknown about Pixar’s upcoming Incredibles 2. The preview finally introduced the new villain, though only briefly, and it still didn’t show much outside of the actions of the main Parr family. But some newly released info reveals there will be some other super-powered people in the mix. Some of the movie’s action, we now know, has to do with a subset of superheroes who weren’t in the first movie. They’re called “Wannabes,” and here’s a piece of concept art. Concept art of the Wannabes from Incredibles 2. According to Screencrush and other outlets that recently visited Pixar on behalf of Incredibles 2, these characters are people with superpowers who aren’t fully formed superheroes yet. They aid Elastigirl (Holly Hunter) in her corporate-funded journey to attempt to make supers legal again, which makes up the basic plot of the movie. From left to right in the image above there’s Screech, who has a super-powered scream and can fly like an owl; He-Lectrix, who can shoot lightning from his fingers; Reflux, who can create and manipulate lava; Brick, who is super strong; Krushhauer, a telekinetic superhero; and Voyd, who can created voids to remove things from existence. Voyd is voiced by Sophia Bush and is a super-fan of Elastigirl, not unlike Syndrome in the first film. We aren’t quite sure how important these characters are to the plot of the final film, but here’s a clue. Look at the feet of Mr. Incredible and Elastigirl on the official poster. The poster for Incredibles 2. There they are. So they’re crucial enough to make the poster. We’ll likely have to wait until June 15 to find out much more.